JNN 19 Sept 2014 Sanaa : Over two dozen people have been killed in clashes between Houthi fighters and local tribesmen in northern Yemen. According to Yemeni security officials on Monday, fighting broke out in the district of al-Ghayl in the Yemeni Province of al-Jawf. At least 25 people were killed and many others suffered injuries in the clashes. The Houthis have also been staging demonstrations in the capital Sana’a for more than a month, demanding the formation of a new government and the reinstatement of fuel subsidies. They say the government is corrupt and marginalizes the country’s Shia community. Meanwhile, Human Rights Watch (HRW) has called on Yemeni authorities to probe the recent use of force against anti-government protesters on September 7 and 9 in Sana’a. The international rights group released a statement on Sunday, saying that the Yemeni government must bring to justice military personnel and other security forces accountable for opening fire on demonstrators, which led to unnecessary loss of life and numerous injuries last week. 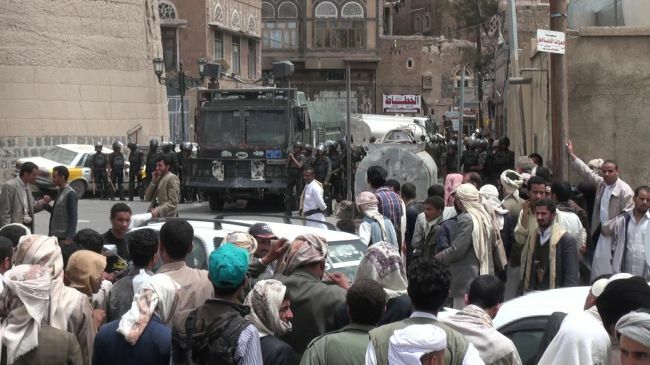 According to the statement by the rights group, the Yemeni forces killed at least eight demonstrators and an ambulance driver and injured at least 67 others in the demonstrations in the Yemeni capital. Local security officials say Houthis were killed in a military air raid in the northern province of Jawf on Wednesday. The casualties come after Yemeni air force hit the house of a pro-government tribal leader which was stormed and held by Houthi fighters. In a separate development, at least ten people were killed and dozens more injured in a confrontation between government forces and protesters southern Sana’a. Thousands of Houthis and other revolutionaries have been staging protests in the capital city of Sana’a for nearly a month with angry revolutionaries accusing the government of corruption and urging its resignation. On Monday, the Houthi leaders said they had suspended their participation in talks with the government over what they called foreign intervention in the negotiations. Rupert Colville, the spokesperson for the UN High Commissioner for Human Rights, has urged Yemeni officials to probe the recent killing of protesters in the country’s capital. “As Yemen faces various internal challenges, it is more crucial than ever that violations of international human rights law are not swept under the carpet,” media outlets quoted Colville as saying. Shia Houthi protesters have been holding demonstrations since August 20 in a bid to press the government of Yemeni President Abd Rabbu Mansour Hadi to quit. They say the government is corrupt and marginalizes the country’s Shia community. This entry was posted in Middle East and tagged demonstrations, government forces, Human Rights Watch, shia community, yemeni government, Yemeni Province, Yemeni Shia Houthi Fighters. Bookmark the permalink.